Garrett Clark, we hardly knew ye! The Aussie-lite Canadian standup first visited us five months ago. He's back again so soon to bid us a fond adieu as he's packing his bags and moving down to Los Angeles. We find out about his plans and he talks about his love of generic rock, his adult circumcision, and his disdain for movie extras, even though he is one himself on occasion. Best of all, he entertains us with spot-on impressions of Hank Hill, Jiminy Glick, Damonde Tschritter and Richard Lett. You can listen to the whole thing for free! Right here! It's even free at iTunes and Stitcher and PodcastLand if you want to download it or subscribe. I say this in case you're new to podcasts. It's nothing special. That's how they all work. Glenn Wool returns. Literally. He's back in studio with us, but he's also back living in Vancouver, where he belongs. Well, Surrey, anyway. Close enough. But he's still touring the globe, as he tells us in this episode. While here, he's fitting right in to the west coast lifestyle. When he's not taking long strolls around the Seawall, he's taking yoga classes (and silently giggling). Here we talk about immortality (he's done the math), his battle with Aasif Mandvi, and his bromance with Frankie Boyle. Enjoy the banter below. Or go subscribe and/or download the episode on iTunes, Stitcher, PodcastLand, or wherever fine podcasts are dispensed. 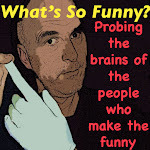 Garrett Clark returns to our studios a mere five months after making his What's So Funny? debut. What could we possibly have to talk about so soon? Well, for starters, he's leaving us. In a matter of days, Clark will be driving off in his baby blue Ford Windstar and heading for the bright lights of Hollywood, California, to seek his fame and fortune in comedy. This will be his big send-off. So that's the big topic of conversation but we've got plenty more. And you can be guaranteed I'll get him to do his uncanny Richard Lett impression again. If you haven't heard it, it really is amazing. We're on the air at 100.5 FM in Vancouver at 11 pm. Livestream us at coopradio.org. It's what all the cool cats do. Are you ready for another Brian Regan interview? Who isn't? The guy is simply the best. And what a pro. I assume a fella at his level wouldn't need to do the endless press he seems to do, but he does it and he does it willingly and politely. A real gentleman. I spoke to him in December. I didn't get to see his show here in January, but he rolls through town every year or two so I'll catch him next time, I hope. Here's our latest conversation. "It feels like the people that have helped push me along have always been other comedians. The entertainment media in general, I always feel like they just kinda had a blind eye towards me." Brian Regan: Hey, this is Brian Regan calling for Guy. GM: Good thanks, how are you? BR: I'm great. Our next interview in a series of a few, so thank you. BR: Yes, and a podcast, which I enjoyed doing with you. GM: Thank you for that. GM: I was just thinking how for years and years I knew of you but you never played Vancouver. And now you're a regular. BR: Yeah. I was looking at this little list here. I've done 2007, 2010, 2012, and 2013. I'm liking including the Canadian experience in my shows. Vancouver's a fun place. GM: What do you mean by the experience? Onstage experience? Are we that different? BR: I mean the onstage experience. I was thinking about how you can make all kinds of metaphors about comedy but one is I like when the comedian builds half the bridge and the audience builds the other half of the bridge. I always find Canadian audiences are very, very willing to do their part of the construction work, you know? They build their half of the bridge. Sometimes they'll build even more than half. And it's nice. That little meeting point in the middle is the laughter. American audiences, as much as I love them, sometimes they're not as willing to build their half of the bridge. They're like, 'We're sitting here and you complete the entire span until reaches us.' So it's fun to be on stage and feel like, wow, the other half is working. GM: It's because we all wear work boots. Part of you becoming a regular here is that comedy's really opened up in the last however many years, where we get so many more touring comics and it's more in our consciousness. Do you find that? BR: Well, comedy's this ever-evolving thing. What's interesting lately is it can take so many different forms now. With the internet, it's not confined. It seemed to be with standup comedy, you were either on stage as a standup comedian or you would get a sitcom. Those were your two outlets that were available to you. Now you have podcasts and Comedians in Cars Getting Coffee and YouTube clips and little sketches. There's all different kinds of ways to be funny. I think it's kinda opening up the game a bit. GM: Yeah, it used to be just the Evening at the Improv-type shows and other than that just a late night talk show set. That's where we'd see comics. BR: Even Evening at the Improv was still standup comedy. It was standup comedians on stage doing standup comedy. I love standup comedy. It isn't like I want that to go away but it's interesting to see that different things have morphed off from it, you know? GM: You recently did your 26th Letterman. Do you do the other talk shows, too, or are you exclusive to Dave? BR: Well, I just did the 27th about a month ago. That show has been very kind to me over the years. I feel like they like what I do or else they just keep giving me more and more opportunities to finally make it right, I don't know. It isn't that I don't want to do other shows; it's just I'm on Letterman, like, every nine months. I've got a good thing there so I kind of stay in that track lately. GM: Is it hard to pick four minutes, or however long you get on a late night set, and to go in cold like that? BR: It's definitely challenging. It's thrilling, but it's also very challenging. When I'm performing out on the road, I have the luxury of performing in front of a bunch of people who are holding a ticket that says Brian Regan on it, you know? They already know what I do or else friends have said, 'Hey, you gotta go check this guy out. He's kinda funny.' But when you go to do Letterman, or something like that, those people aren't sitting in that audience to see me. They're there to watch Dave Letterman and a TV taping and you just happen to be on it. And they might know who you are or they probably don't know who you are. At least me. So I have to go out there and very, very quickly, but without looking like I'm being frenetic, establish who I am, establish a theme, get a roll going, and be done in four-and-a-half minutes. It's a lot more challenging than people might think because you're trying to make it look effortless when it's anything but. GM: In a theatre show, you can really ease your way into a bit or get to know the audience a bit. BR: Yeah. And that's part of the fun in it, seeing how quickly you can get people hooked in and that sort of thing. I remember years ago, before I even did a TV taping... I'm pouring coffee so if I'm slowing down, it's because I'm not capable of talking and pouring coffee simultaneously... Alright, anyway, coffee's poured. I can get back to my normal speech... So I remember hearing a comedian talking about doing The Tonight Show and he said it's very important to expect the first joke to not work. He said the first joke is going to be a foul ball and if you expect it to be a foul ball, you're in much better shape than if you're expecting it to get a good laugh. Because if you're expecting it to get a good laugh, and then it doesn't, it can throw you. And I'm glad I heard that years ago. So I approach every set that way. So when I go out there, it feels comforting to already giving yourself a foul ball. GM: That's a good life lesson, too. Keep your expectations low. BR: Yeah. And then when you go out there and the first joke doesn't get a good laugh, you go, 'Well, this is what I was expecting all along.' And if it does get a good laugh, well then that's even better. GM: Bonus. Do you remember who said that? BR: I don't want to attribute it to the wrong person. I have a feeling that it was David Sayh but I'm not a hundred percent sure. "I love the standup comedy world and I've kind of resigned myself over the years to the fact that, for whatever reason, it's probably not going to branch out beyond standup comedy." GM: Now you're a master thespian. Congratulations. BR: (laughs) Yeah, these last couple of months – I mean, I did the thing a year ago – but the last couple of months since it's been in the process of coming out and the premiere have been so strange and so weird and so different for me. But I'm enjoying the heck out of it. It's a completely new experience. It's just weird the way it's all shaken out, you know? I mean, I went from two months ago thinking I was cut out of a movie to realizing not only am I in the movie, they're using me in the trailer and they're using me in the ads and I'm getting some pretty decent buzz about it. I'm like, wow... It's just really fun. GM: I haven't seen it, but I did see the trailer. You joked on Letterman that that's basically the whole thing. How much are you really in the movie? BR: It's just that scene but they've broken it into a couple of parts. It's kind of hard to explain. Chris Rock's character is a comedian-slash-actor. He's going around doing promo. He's going around doing radio interviews. I play a radio engineer who's asking him to do a liner and when he does it, I just keep telling him to try to make it a little bit funnier. I know what that's like. I can relate to that. So he gets increasingly upset with me. So we start with that, and then in the scene he goes and does all these other interviews, and then they concluded by coming back to me, like as a callback, continuing with getting him upset about me telling him to try to make it funnier. It was a very fun scene to do. I just could relate when I read the script. Like I know this guy inside and out because I've lived it, you know? It was fun to do. GM: You did it really well. It was believable and funny. BR: Thank you. I appreciate it. I'm not patting myself on the back because I'm not an actor. I don't know anything about that world. I didn't even feel like I was acting. I just felt like I've experienced this guy so many times in these radio stations, I know what the vibe is. So I felt I just had to be that. Be the guy that I would be upset at. So I just became that. GM: Was that your first movie? BR: Oh yeah, yeah, yeah. GM: How great is it that it was with Chris Rock and it's getting all this buzz? Your first movie could easily have been some dud. BR: Yeah. It's weird. I've been at this for years. I love the standup comedy world and I've kind of resigned myself over the years to the fact that, for whatever reason, it's probably not going to branch out beyond standup comedy. But the planets just lined up. Chris Rock came and saw my show. I was performing at a theatre in New Jersey and I was told he was in the audience. Then afterwards he came back and said hello. He didn't say anything about a movie. Then a few weeks later I get this call that they want me for a scene in a movie that he's making. I'm like, whoa, okay. Next thing I know, I'm in New York and I'm doing this scene. And it was about a year after that that the thing finally started coming out. And I swear I thought I was cut from the movie because I went to that imdb thing and it says 'Cast'. Then it says 'Full Cast'. So I click on Full Cast and it says, like, 37 names or something. I scroll down and I'm not in there! (laughs) And I'm like, 'Oh, man.' But then it just turned out there was a goof-up on imdb, I guess. GM: Again, you keep your expectations low and then you're surprised. GM: When you knew he was in your audience, did it affect you at all? BR: Nah. I've had so many situations where there were important people or auditions or family members that you learn not to let that affect your show one way or another. I mean, I was honoured that he was there but I don't think it affected my show any. GM: Is this going to lead to more acting? BR: No, no. Getting back to the keeping expectations low, nothing I've ever done has led to anything! (laughs) I mean, beyond what it is. I do the Letterman spots. I never get a phone call the next day from NBC or CBS. I have my standup comedy following and that's great and all that sort of thing. So I'm not expecting Steven Speilberg to see this and give me a call. Because that kind of thing just doesn't happen my way. GM: You've had such integrity with standup. Your goal is to be the best you can be at that and then other things fall into place. Sometimes comics that maybe aren't as committed to the craft branch off and do these other things and they're sort of half-assed at everything. BR: I don't want to be derogatory about somebody else. Standup to me is my thing. If something were to happen from this, I'd be open to it but I certainly don't expect it. GM: I see you've joined the fraternity of arena comics. BR: I have this huge following in the Mormon community so I did the Energy Solutions Arena, which is where the Utah Jazz plays. I did two shows there. Two nights, Friday and Saturday, a few months back. Man, that was other-worldly. That was just something else. It was a blast and an honour to have that size of an audience come out to see what you want to do, so that was pretty cool. GM: Is it like what you told me about occasionally getting a private jet and making you realize the regular plane is like taking the bus? GM: Did you have to change anything you do for the arena? Or back to the theatres? BR: I just had to be cognizant of sight lines. I was on the big screen and I realized a lot of people that are higher up are probably watching that even more so than me on the stage. So I wanted to be aware of that and also make sure I'm walking around enough and facing different directions. It's challenging playing quote "in the round" even though it was a big square stage, because a lot of my jokes are visual and they're like a little play. It's me and another character and sometimes within a joke I'm setting up a situation. Like, it might be me talking to a person at a check-in desk at a hotel or something like that. And once you've created this visual, even though there's literally not a desk there but you're suggesting it, in the middle of a bit you have to be careful and go, 'If I turn now so more people can see me, have I just blown the visual?' You know what I mean? So all those kinds of things are going on in your head while you're on stage going, 'Should I commit to not turning for this entire bit because I've established a visual here? Or is the bit too long and if I don't turn then people are going to feel like they're left out?' You're constantly making decisions while you're on stage. GM: So you were in the middle. I've seen arena shows where it was at one end and they just took out the seats behind the stage. BR: Yeah, I've done those, too. I did one at a college and it was in the basketball arena. My stage was where the backboard and net would be and facing away from the court so it was like maybe a third of the basketball audience. Two-thirds of it was just dark seats. This was when Dane Cook was hot. I walked into the theatre and the college kid who was in on the show goes, 'You know, we had Dane Cook in here a couple months ago.' And I say, 'Oh, that's cool.' And he said, 'Yeah, when his tickets went on sale, all of these seats' – and he pointed to the ones for my show – 'they all went in about ten minutes so we had to move the stage to halfcourt. And then those all sold out in another ten minutes so we had to move the stage all the way back here. So he ended up selling out the whole thing.' And I was like, 'Oh. Okay.' (laughs) But for me it's fine right where it is, huh? It was funny because I knew it didn't even dawn on him that this might not be something I'd interested in hearing at the time. Nothing against Dane Cook. I'm happy for his success. But it was just weird that he was matter-of-factly telling me that the guy drew five times as much as I did! GM: Last time you were here, you had done the Comedians in Cars Getting Coffee episode. We talked a bit about it. But I didn't realize when you shot yours, none of them had been released yet so you didn't know how to approach it. GM: So now that you've seen them, would you have done anything differently? BR: I don't know. I don't know. That's a good question. I'm kinda glad that I hadn't seen any. I had no choice but to just go, 'I'm going to make this a conversation. Let him lead the way and I'll just follow.' It's hard to say how it would have affected me if I had seen some. Maybe I would have felt a little more performance-oriented. The thing I liked about it was that we taped for like four hours and they only used 12 minutes. There was plenty of stuff that wasn't funny. I didn't feel any pressure. It was just two guys hanging out and they kinda clip it down to the funnier moments. GM: Did you see his hour-long interview with David Letterman? GM: It's online. It wasn't on Letterman's show. Letterman interviewed him specifically about Comedians in Cars. He talked about how they film for hours. They showed some raw footage and all these dull moments. Then they showed the edited version. It was great to see. BR: It was a lot of fun to do. What's weird is when you're in the car and you're just talking. I never forgot that we were being filmed but you get kinda lulled into you're just having a conversation with a friend. Then you're at a red light and a van pulls up with a 30-guy film crew hanging out of the side of the van! And you're like, 'Oh, I forgot about that for a moment.' You realize, oh, this is all being filmed! Strange. GM: Did it get a great reaction for you? BR: Yeah, I've gotten some nice comments about that. It was a very cool thing for me. It feels like the people that have helped push me along have always been other comedians. The entertainment media in general, I always feel like they just kinda had a blind eye towards me. BR: No, you've been great. There've been a handful of people who've been great and I appreciate it. But just in general I always felt like nobody seems to care, you know? But then when you have somebody like Seinfeld basically patting you on the back – I mean, I was in his first group that he did and who knew if there was ever going to be a second group? He only did like ten comedians. The fact that he picked me for that was a huge honour. And I think that's the kind of thing that makes people take notice. Like, 'Well, Seinfeld likes the guy; maybe we should give him another look.' And the same thing with the Chris Rock movie. It was another comedian who's putting me in a movie. GM: A really well-respected comedian. BR: Yeah. These people like what I do. They're the ones that have kind of helped me make some headway where I might not have otherwise been able to make headway. GM: It's kind of like high school. When the cool kids tell other people you're funny, then everyone starts thinking that way. BR: Yeah, that's right. Yeah, he's making the football players laugh. Yeah, I think there's an aspect to that. So I have such a strong kinship, feeling – I don't know if that's grammatically correct – I like being around comedians. Seinfeld recently was talking about that. I don't know if you saw his Brian Williams interview. Did you see that? BR: He said that he thinks he's on the autism spectrum. GM: I read that, yeah. BR: And he said one of the reasons is because of this social awkwardness that he has. He says he only feels comfortable around comedians. I don't take it that far. I mean, I am capable of being comfortable around other people, but I do have a strong comfortability around other comedians because I feel like it's something we all share. It's kind of hard to put into words. GM: You have a shorthand with each other. You know how their brains are going to react to what you're saying. They're not going to think you're strange. BR: And also what's weird is, it's comfortable being around people that you feel like you don't have to be funny around. Comedians know that comedians are not always funny. So when you're around other comedians, you feel comfortable not being funny. Sometimes if you're in a party situation or somebody just finds out you're a comedian, sometimes that takes a very odd turn where they don't know what to do with you at that moment. They think you're some kind of clown on display and it gets kind of strange. GM: Or the worst is when they laugh when you're not even being funny because they're expecting you to be funny. BR: Yeah, I didn't realize that was a big funny joke. GM: Are you doing 100 weeks a year? No, wait. There aren't 100 weeks in a year. BR: (laughs) Well, I'm that good when I do 100 weeks of comedy in a 52-week year. GM: You have a Gallagher 2 type of situation maybe. BR: (laughs) No, I do about 100 shows a year. GM: That's what I meant. Over how many weeks? BR: I try to work half the weekends of the year. I do 26 weekends out of 52, give or take. And then I do four shows each weekend, Thursday through Sunday. GM: So after your show here, you're jetting off to the next place. BR: We were just trying to do travel. That's going to be a very strange week. I'm in Eugene, Oregon, Thursday. Vancouver Friday. Then we gotta get to Anchorage for Saturday. And then back to Edmonton for Sunday. And it's proving to be much easier to write on a calendar than it is to actually book travel for. GM: Really? It seems logical. The last time you were here, you played Alaska the next night, too. BR: Yeah, but that concluded the week. Trying to get back and do a show in Edmonton on that Sunday, we're trying to figure it out. It's going to require some flights that are hopefully not delayed. GM: And great, as always, talking to you. BR: I appreciate it. And I appreciate the support you've given me over the years. It really means a lot to me. So thank you. Diana Bang makes her podcast debut with this episode. That's probably almost as exciting for her as getting a supporting lead role in The Interview with Seth Rogan and James Franco. Yes, Bang starred as Sook, the communications/propaganda minister under a fictionalized Kim Jong Un (don't want no trouble 'round here so I want to stress it's fictionalized). Prior to this star-making vehicle, Diana was known for her roles as Coffee Shop Server in No Clue, Barrista in Miracle in Manhattan, and Market Cashier in Guess Who's Coming to Christmas. We talk about her surreal ascent to the red carpet, her Vanity Fair photoshoot, Seth Rogan's luscious lips, her work with local sketch troupe Assaulted Fish, and she tells us why you should never trust an acting teacher. Help celebrate her first podcast by listening to it. You can click below to start your journey or you can download it at iTunes, on Stitcher, PodcastLand, etc., etc. Get moving! Tonight we welcome back – and welcome home – Glenn Wool. The first time he was with us, back in 2012, Wool was living in England. Or was it Los Angeles? It's hard to keep up with him. Last I heard he was now making his base in the city he left back in 1995. That'd be Vancouver. But we'll find out for sure tonight. We'll also find out if his voice is in any better shape than it was the last time he was here. Maybe Vancouver's softened him up. Below is a short clip of his last visit to get you in the mood. We're on the air at 11 on CFRO 100.5 FM. For Glenn's fans around the world, fret not, you can livestream the show on coopradio.org. Our first guest of 2015 was Ron Vaudry. The guy's been in the business for 36 years and it was his first time on our show. Then again, he's lived in England for the past ten years. But he's in Vancouver now and we nabbed him. We talked about the early days when he and a ragtag group of comics set out across this great nation to bring laughs to the outposts. We talked about Foxy Boxing. We talked about conquering the U.S. through comedy competitions. And we talked about his love for hating the Canadian entertainment industrial complex. It's all right here for you. It's also in places such as iTunes, Stitcher, Podbay.FM, PodcastLand, and, you know, elsewhere. So get on it. Regular listeners to What's So Funny? might know about my fascination with North Korea. I've seen all the documentaries on it, have read a couple books, and follow the relevant Twitter feeds. And over the holidays, I watched the controversial new comedy The Interview, written and directed by local boys-gone-big Seth Rogan and Evan Goldberg. Nevermind that Pyongyang was played by Vancouver, the breakout star of that movie was Diana Bang. Diana is a sketch performer and actor. I've seen her with her troupe Assaulted Fish and I've seen her in a staged reading of a Shauna Johannesen play at Pacific Theatre. 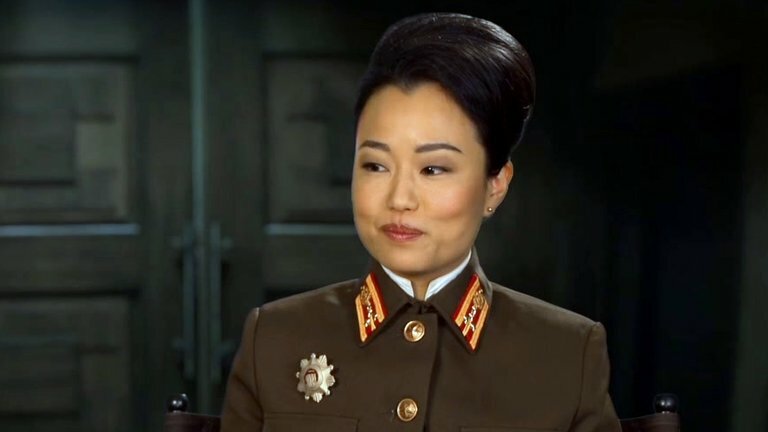 Yet it took for her to star in the controversial comedy The Interview and be featured in Vanity Fair magazine for me to invite her on the show. What the hell is wrong with me?! My bad. That's all I can say. Anyway, we'll talk about all of the above on the show tonight. It will be a propaganda-free hour, I promise. We are on the air, as usual, at 11 pm on CFRO 100.5 FM. You can livestream us anywhere in the world (except, I'm guessing, North Korea) at coopradio.org. Have you forgotten all about 2014 already? Take this quick refresher. It's our annual year-end recap with Harry Doupe. We start off with the old chestnuts: the Canadian Comedy Awards and YYComedy Festival but quickly branch off to talk about the flicks The Interview, Corner Gas: The Movie, and The Grand Seduction, move over to the year in comedy deaths, discuss Demetri Martin's response to hecklers at the JFL stop in Vancouver (which sidetracks into Harry's worst experience with hecklers), Christmas specials from Russell Peters and Dave Foley, Lachlan Patterson's appearance on Last Comic Standing, and the upcoming CBC sitcom Schitt's Creek. It's all you want in a madcap recap. Relive those memories below. Or go download the show at iTunes, Stitcher, PodcastLand, TuneIn Radio, and elsewhere. January 5, 2015 (Vancouver, BC) - John Mulaney is quickly becoming one of the most sought after young comedians and actors in the comedy world. Mulaney can currently be seen starring in FOX’s new comedy Mulaney, about a rising stand-up comic trying to take his career to the next level. He also serves as creator, writer and executive producer on the series. Mulaney began his career in New York’s East Village as part of the two-man “Oh Hello Show” with comedian Nick Kroll. He has since performed everywhere from Ireland, to Australia to Grand Isle, Nebraska. He was named one of Variety’s “10 Comics to Watch” in 2008--the same year he began working at Saturday Night Live where he appeared as a “Weekend Update” correspondent and co-created characters such as “Stefon” with Bill Hader. Mulaney currently resides in Los Angeles. Tickets go on sale Thursday January 8 at 10am PST at northwestcomedyfest.com. Lafflines, New Westminster - Official Satellite Venue!